Within a short driving distance of wild Exmoor, the North Devon and Somerset coast, and many pretty villages and river valleys. A large secluded house with lovely views overlooking 60 acres of its own woodlands and the Exe Valley. 1 mile from Bampton. 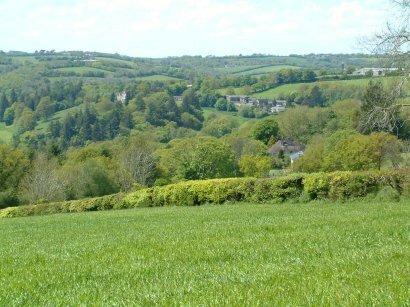 The house stands in the Exe valley between Bampton and Dulverton. The area is full of quiet and unspoilt corners for those who wish to walk or watch wildlife. Dulverton and Bampton are both old and pleasant towns  small but with simple shopping facilities. Dulverton, four miles from Westbrook, is the gateway to Exmoor and headquarters of the National Park Authority. Local pubs and restaurants serve excellent food in pleasant surroundings - we'll suggest where you might try. Tiverton is 7 miles away. Taunton or Exeter are 22 miles away. The North Devon link road, five miles away, provides fast access for those who wish to strike further afield  to West Devon or Dartmoor and the South coast. The house is set in extensive gardens. Behind it are open fields and, at the top of the hill (with long views in all directions), is our own 80 acre farm, Westhill Farm, over which our visitors can walk. An all-weather tennis court can be used at any time. To the front of the house, running down to the river Exe, are wooded grounds of 60 acres with good tracks for walking and picnics. In the woods (and often the garden!) are badger, roe and red deer, foxes, rabbits, stoats and a wide variety of birds. We'll show you where to go for the best sightings. Our pictures (click on the captions at the right) will show you much more. The Garden Annex Flat: occupies most of the upper floor of the Garden Annex adjoining Westbrook House. It looks out on wide views. There is parking next to the flat and a short flight of internal stairs from its own entrance. The accommodation is for two people. Fully equipped kitchen with refrigerator, electric oven, microwave, electric kettle and toaster. The dining room/lounge includes a settee, armchairs, colour TV and video-recorder. Bedroom with double bed and adjoining bathroom with bath, shower, basin and WC. Night storage radiators. Bed linen and towels are provided. Our bookings run from Saturday to Saturday throughout the year. We ask visitors to arrive after 2 pm on the day of arrival, please, and vacate by 10 am on departure. We regret - no children or pets.